Reach your potential by embracing your personality and plotting a new course. Join our free newsletter to take the Leadership for Introverts Test and start building your skills. The gist: To start building your leadership skills, copy someone you admire. But to master them, apply your own vision and values. Made a lot of money. There’s another band, though, that’s giving them a run for their money. They’ve been together nearly twenty years with no sign of slowing down, their fans are ravenous, they’re unimaginably successful, and they play hundreds of live shows each year. They’re called Dark Star Orchestra, and they’re a Grateful Dead cover band. Is this a fluke? Something in the water? Everything we’ve learned about success is typically wrapped up in being original—doing something no one’s ever seen before. There is something about being original. There’s value in creating new and unique things. But Dark Star Orchestra is a proof you can become wildly successful just by carrying the torch for those that carried it before you. You can lead an audience on a journey they were already on. This is just one example. There are more. And many of the greatest leaders, thinkers, and inventors in history built their platform on top of someone else’s creation. To be an effective leader, just copy the great ones who came before you. Of course, we all eventually come to the realization we want to be more than just good. When you want to be great, there’s another ingredient to the recipe. Keep reading to learn what it is and how you can use it to become a stronger leader. We all started our training regiment the same way. Years ago, we watched our parents effortlessly walk from one end the house to another. We wanted that. So, we tried to copy it. Our inability was painfully clear at first. But, eventually, we learned to walk. And even to run. It was slow at first. But then fast. We watched those around us, and we quickly decoded their skills until we could do what they could almost as well as they could. Mimicry is the fastest way to build a new skill, and you can learn a lot just by watching. That’s about where our similarities to Usain Bolt end, though. What sets him apart is who he chose to mimic and how dedicated he was to getting it perfect. In 2014, The New York Museum of Modern Art held an exhibit with dozens of pieces from some of the most popular artists of the 20th century. Warhol, Johns, Beuys, Haring, and Lichtenstein were all on display. Except, none of the pieces were created by them. They were all masterful forgeries created by Elaine Sturtevant—the artist now famous for creating pieces so close to their original the casual observer could never tell them apart. She spent the better part of a century perfecting the craft of copying, and it made her world-renowned. The obsessive attention to detail. The relentless practice to create the perfect carbon copy. The days, months, and years of refinement. These are the things that lead to incredible skill. The members of Dark Star Orchestra walked into a practice room one day as a novice band and walked out as the near-reincarnation of The Grateful Dead. It just might be the next best thing but not quite me! 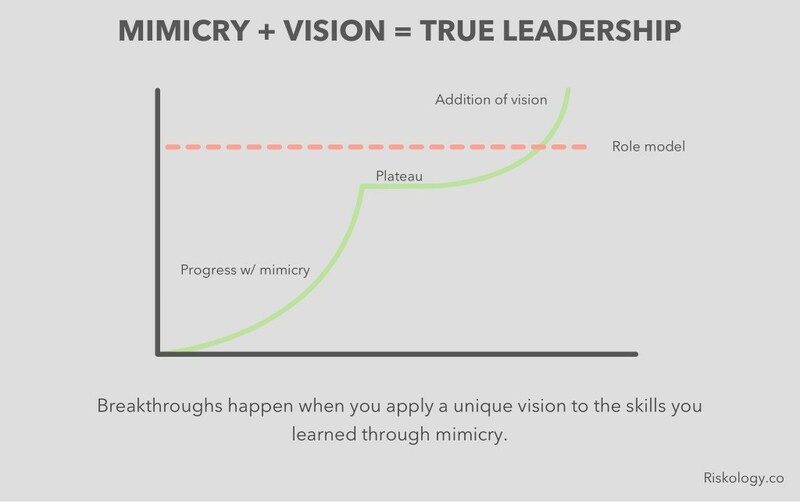 If you want to develop your skills as a leader, mimicking your role models is the fastest way to get up to speed. Eventually, though, most of us will want more—to create something of our own. When that moment comes, there’s one more piece to the puzzle. Would it be blasphemy to call Galileo, the “father of modern science,” a copycat? I don’t think so. Those who know science know those who contribute the most to it build something new from what’s already well-established. In 1608, a Dutch scientist by the name of Hans Lippershey filed the world’s first patent for a telescope.3 It could magnify objects three times over and was used to study things like birds, mountains, and landscapes. A year later, Galileo caught word of the invention and—sight unseen—created his own. He didn’t stop there, though. He continued to build them, tweaking each one until he had a device that could magnify tenfold—a vast improvement. Galileo wasn’t satisfied with only copying what others thought was great. He worked to make it better. But this is more than a predictable story of, “If you want to be great, you have to make something better” that’s been told time and again. Galileo isn’t called the father of modern science because he built a stronger telescope. That would have happened with or without him. He earned the title because of what he did with it. In a time when the world was content with the Catholic Church’s explanation of the universe, Galileo used his new tool to do something few others considered necessary. He pointed it at the stars. Want to be a great leader, yourself? Take the skills you gained from others and apply your own vision to what those skills can be used for. It’s a fair argument. But remember you’ll go the furthest when you have the very best as an example to copy. Today, ask yourself why you want to become a better leader. What would that mean for you? What would it mean for the people you serve? Then, ask yourself who’s already doing a great job. Who can you mimic? If you manage to get it just right, you’ll be good. 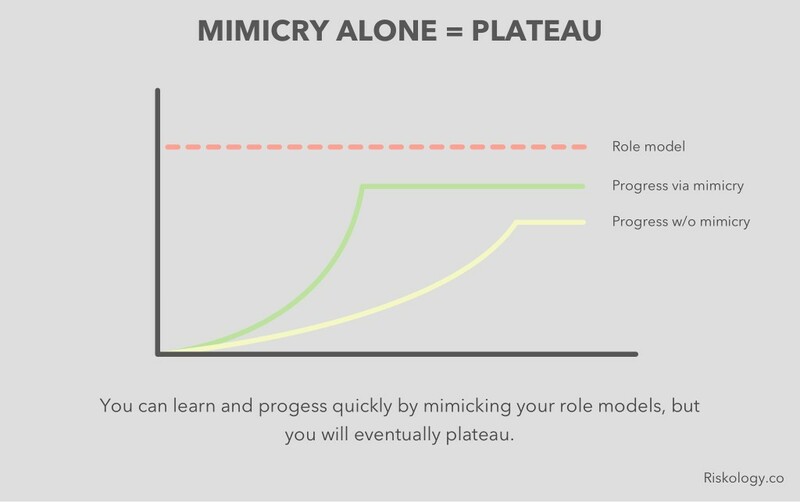 But don’t forget that, once you’re good at the basics, your opportunity to lead only increases the more you allow yourself to use those skills creatively and apply them to your own unique vision. Where will you point your telescope? The Grateful Dead actually lost four—yes four—keyboardists. This sounds like the setup for a joke. Unfortunately, I never came up with a punchline. There is some debate around who actually invented the first telescope. There were three Dutch men who lay claim to it: Hans Lippershey, Zacharias Jansen, and Jacob Metius. While no patent was ever given, all three men contributed greatly to the advancement of magnification. Actually, it was Nicholas Copernicus—a Prussian mathematician—who pioneered this idea, but Galileo is credited with using his telescope to prove it. Just another example of how even the greatest in history stood on the shoulders of those before them. Though, it took awhile since the church sentenced him to a life of house arrest. Automate your productivity to gain time, reduce stress, and improve your health in a few minutes each day. The Systems Course is the most efficient and practical training available for busy professionals who want to do more of their best work and worry less about dropping balls. Learn more about The Systems Course. What type of leader are you? Take our free Leadership for Introverts test and find out right now. Just tell us where to send it.